– The story trophies CAN’T be gained when playing splitscreen. The hero trophies (kill gandalf as sauroman for example) and combat trophies CAN be gained when playing splitscreen. – All the story trophies can be gained on every difficulty. – Combat trophies CAN’T be gained during the tutorial. – The evil/Rise of Sauron campaign is unlocked after you beat the good/War of the Ring campaign. – Ranked trophy can’t be gained with a Hero. In the main menu, select single player and then training level. Play through all different classes and defeat Sauron to get this achievement. Complete the Helm’s Deep level in the single player “War of the Ring” Campaign. Complete the Isengard level in the single player “War of the Ring” Campaign. Complete the Mines of Moria level in the single player “War of the Ring” Campaign. Complete the Osgiliath level in the single player “War of the Ring” Campaign. Complete the Minas Tirith level in the single player “War of the Ring” Campaign. Complete the Pelennor Fields level in the single player “War of the Ring” Campaign. Complete the Minas Morgul level in the single player “War of the Ring” Campaign. Complete the single player “War of the Ring” Campaign. Complete the Osgiliath level in the single player “Rise of Sauron” Campaign. Complete the Minas Tirith level in the single player “Rise of Sauron” Campaign. Complete the Mines of Moria level in the single player “Rise of Sauron” Campaign. Complete the Weathertop level in the single player “Rise of Sauron” Campaign. Complete the Rivendell level in the single player “Rise of Sauron” Campaign. Complete the single player “Rise of Sauron” Campaign. Defeat the Balrog as Gandalf in the Mines of Moria (“War of the Ring” Campaign). In the level ”Mines of Moria” you eventually need to play with Gandalf and need to defeat the Balrog. Be careful though, if you die, you need to die a few times more to get the option to be a hero again. Defeat the Witch King as Eowyn in Pelennor Fields (“War of the Ring” Campaign). In the level ”Pelennor Fields” you eventually need to play with Eowyn and need to defeat the Witch King. Be careful though, if you die, you need to die a few times more to get the option to be a hero again. If you got troubles with scouts/Eowyn, be a class you like after you died first (as Eowyn) and attack the Witch King. If he’s almost down, die a few times until you can play as Eowyn again. Now you only need to hit him one more time or throw a bomb at him. Defeat Gandalf as Sauron in the Shire (“Rise of Sauron” Campaign). In the level ”Shire” you eventually need to play with Sauron and need to defeat Gandalf. Be careful though, if you die, you need to die a few times more to get the option to be a hero again. Do NOT walk on the bridge, the chance that you will get picked up by an eagle is pretty high. Just lure Gandalf over the bridge and fight him on land. Defeat Gimli as the Balrog in the Mines of Moria (“Rise of Sauron” Campaign). In the level ”Mines of Moria” you eventually need to play with the Balrog and need to defeat Gimli. Be careful though, if you die, you need to die a few times more to get the option to be a hero again. Defeat Aragorn as Saruman in Weathertop (“Rise of Sauron” Campaign).In the level ”Weathertop” you eventually need to play with Sauron and need to defeat Aragorn. Be careful though, if you die, you need to die a few times more to get the option to be a hero again. Defeat 3 Nazgul as Aragorn in Minas Morgul (“War of the Ring” Campaign). When you need to destroy the 4 cristals in the level ”Minas Morgul” of the War of the Ring campaign. You can choose to be Aragorn (this is the second chance to be Aragorn, the first one is when entering the castle) and need to defeat 3 Nazgul. Not that hard because there are plenty of them and they aren’t that hard to defeat. At every cristal is one. When fighting the Nazguls, use (L1 + Square) and (L1 + O) as much as your energy allows. (L1 + Square) works very well to “drill” through a crowd, while (L1 + O) break the enemies’ guards. There are plenty of Mages around, so once your health goes low, run to one and wait to be healed. It’s recommended that you heal once your health reaches the 60% mark, since the Nazguls will combo you, and hit you when you’re still on the ground, so you’ll need as much health as possible. There’s no time limit for this one, so take your time, heal as often as you can, and you should be fine. Note that your AI bots will kill Nazguls as well, and those may not count towards your total. I only got the trophy on the 4th Nazgul’s death, so just keep killing them until you get it. Kill 300 hobbits in the Shire in one playthrough (“Rise of Sauron” Campaign). In the level ”The Shire” in the Evil/Rise of Sauron campaign try to kill as many hobbits as you can. In the first part of the Shire level, you’d need to destroy six Hobbits buildings. The Hobbits will keep respawning as long as these buildings are not destroyed. They die in one hit and are very easy to kill, so just don’t destroy the buildings, and finish them one by one until you get the achievement. I’d suggest using a Mage since the fire wall can kill a few at one go, and is also very effective against the ENTs and Captains. You can also heal yourself when injured. Complete any campaign level without dying. Easiest done in first level, Helms Deep. Follow the instructions and stay back. Try to get as many health orbs as you can. Doesn’t matter who you pick but warrior is best at the beginning and archer when defending the gate. If you choose another level I recommend the mage because of their healing power and their long range attacks. Complete a campaign level cooperatively. In the main menu select multiplayer —> splitscreen —> War of the ring and plug in another controller. Just play one level cooperatively and after the ending this trophy will pop up. Kill 100 enemies in one life as the warrior.Use the special combos a lot in big battles and this one will pop up quickly. Try to get as many health orbs and run around mages if you need a heal. Look at ”Blade That Was Broken” trophy for a description. Score 30 hits on the combo counter as the warrior. The combo counter is the number in the top left corner of the screen. At every hit the combo counter will go up with 1. Easily performed by holding (L1) and pressing (Square). This takes an amount of energy so try to kill some enemies when in need of energy. *Best done at Helm’s Deep level, when you need to defend the gate. This is where there’s a stair down and catapults flying all over the place. Head down the stairs and do (L1 + Square) (energy must be full) over and over again and you should get over 30 hits in the matter of seconds. You can also do this trophy on a ballista or the tower in Pelennor Fields. Just hit it until you hit the 30. Get 25 headshot kills in one life as the archer. When playing any level in the campaign select the archer. Now try to aim for the heads. You can only headshot someone when zoomed in. Do this by pressing (L2). Then aim for the head and press (R2). If the words ”critical hit” appear you know you got a headshot. Just shoot till the trophy pops up. Mainly the enemies die with one headshot. Stay back and let your allies do the fighting. Need to be done in one life so don’t die. Look for description at ”Rain of Fire” trophy. Kill 25 enemies in one life with the archer’s fire arrows. You can activate fire arrows with the (O) button. Your bow will turn red. Fire with (R2). Kill 25 enemies with the fire arrows without dying. The fire arrow takes about 5-10 seconds to respawn. This has to be done in one life so don’t die. Stay back and let your allies do the fighting. I found it easy to pick enemy archers because they stand still. *Both the above can be easily unlocked in Helm’s Deep, just after you defend the gate. Instead of heading to the next objective, position yourself behind the right wall (which is next to the area you need to defend earlier), and then wait for enemies to appear. Kill one with a fire arrow (it’s a one-hit kill), and then the rest with normal arrows. The enemies will keep respawning in small amounts, not enough to pose you any danger, while giving you all the time to charge up the fire arrows. You can hasten the process by using (L2) to zoom in, and then going for fire arrows headshots. From time to time, a Warrior enters here. Just kill him normally and repeat the process on the other enemies. Estimated time is about 10-15 minutes to unlock both trophies. Use the scout to backstab 10 enemies in one life. You can go stealth with the (L1) button. Then you need to go behind an enemy and backstab him with (R1). When you do this, go in stealth again and find another victim. Try not to get hit and pick enemies who are far away from the large groups because a scout dies quick and you need to do this in one life. *Do this in the Mines of Moria level. In the beginning, there’s a large room with several enemies. Backstab them all one by one. Your AI will kill some too, so try your best to do as many as possible. Then after meeting Gimli, try to survive and pick some wanderers that are left after the fight. Kill 25 enemies in one life with the scout’s bombs. As a scout you can throw bombs with (R2). It takes some time to respawn so throw one, stay back and wait for the respawn and throw again. Easy in big battles. You can kill multiple enemies with only one bomb. Easy in the ”Minas Thirith” level, when defending the gate you can throw your bombs at the gate entrance and try to hit multiple enemies. Heal 30 allies in one life as the mage. When your a mage you’ll see allies with a cross above their head. Walk towards them and press (L1). This will heal them. Repeat this 29 times without dying. Kill 100 enemies in one life with the mage’s fire wall. You can use the fire wall with the (O) button. you´ll create a fire wall/area on the ground which damages all the enemies who are inside or who will walk through it. Do this in big battles and stay back so you will not die. If you get hit, heal yourself with (L1). Kill 25 players as the warrior in any ranked match. Select Multiplayer in the main menu. Pick War of the ring or conquest and not Team Deathmatch because the players may be easier to kill if they don’t go for the kills. Then select warrior as class and try to get 25 kills before your team or the enemy gets 1000 points. Its best to fight warriors and assassins because they are easy to reach. Archers and mages may walk away and are harder to fight. Use the combo when you have enough energy. Not that hard if you go for the kills. Headshot kill 10 players as the archer in any ranked match. Same game modes as the “Blademaster” trophy. Try to aim for the head and stay back. You notice a marker if you headshot someone in the kill list. You need to kill the enemy, not wound him. Try using fire arrows (O) for a instant kill. Backstab 10 players as the scout in any ranked match. Kill 15 players with the Mage’s lightning in any ranked match. When you press (R2) as the mage, he will shoot lightning. If you hold it you can hit multiple foes. Just stay back and heal yourself when needed. Score the most points on the winning team in any ranked online match. Easy to do in Conquest. Don’t go for the kills but try to capture points. Also try to be first when you’re close to 500 points so you can be a hero. This way you can get more kills and secure your first position. Kill 30 enemies in a ranked Team Deathmatch match. Choose the class you like the most and go for the killing. I prefer the archer because you can steal kills with (L1). Capture 3 rings in a ranked Capture the Ring match. Look at ”I will take it” trophy for description. Capture 10 control points in ranked Conquest match. Use the boosting method. Both players only need to run around capturing control points. Ignore the scores and just go standing in the circles to capture. If you do not have anymore to capture, ask your friend to capture one of yours, and then recapture it. 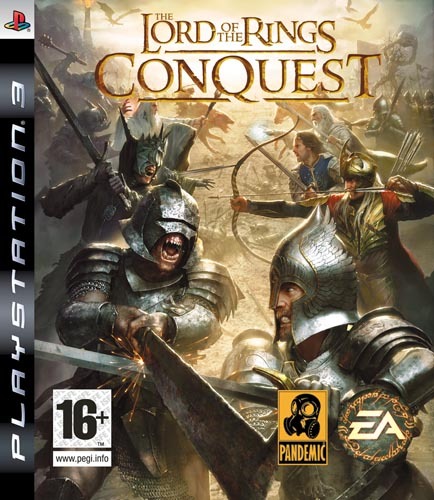 Both players can unlock the trophy in one session as long as they keep finding control points to conquest, even if the points have been previously captured before. Kill 20 enemies with Gimli in any Team Deathmatch game. This one can be gained by setting up an instant action match. Choose any map where you can play Hero-TDM, change the setting to 100 kills and choose Gimli and kill 20 enemies. Choose the map Mount Doom because you can be Gimli and Legolas. Kill 20 enemies with Legolas in any Team Deathmatch game. Look for tactic at ”You have my axe” trophy. Just choose Legolas after you got the trophy for Gimli and go for the 20 kills. Capture a ring with Frodo in a ranked Capture the Ring match. Combined with “Rings Of Power” trophy. To win a Capture a Ring match, you’ll need to pick up the Ring, and deliver it to a required destination. After you successfully deliver two rings, you’ll get the chance to play as a Hero. The only time that you can play as Frodo is in the Shire map, and you must be on the “Good” side. Choose to play as him, and then deliver the final ring to win the match to unlock both trophies. Unfortunately, you can’t choose which map to play on. The maps cycle through themselves. So after you get it, continue playing this mode through the rest of the maps until you get the Shire again, and help your friend with it. Kill 10 players in one life as the Witch King in any ranked match. You’ll get the Witch King as your team score reaches half of the score and your ranked first in the match. Now you need to kill 10 players as the witch king without dying. You only have one chance because you don’t have another opportunity to be the witch king in one match. Use the boosting method for an easy way. Get picked up by a fell beast or eagle. In the level ”Minas Tirith” in the War Of The Ring campaign, you need to defend Frodo while he’s going towards Minas Tirith. First you need to cross a bridge. I stayed on this bridge and fought some orcs as the hero when randomly a Fell beast picked me up. In the level Pelennor Fields are also opportunities to get this trophy. Climb and kill an Oliphaunt. You get this in the level “Battle of Pelennor Fields”. Use the scout to sabotage the two towers, and two Oliphaunts will appear. Get near to the feet of one to trigger a prompt. You’ll enter a button-press mini-game. Complete the three parts of the game to kill the Oliphaunt for this trophy. You only need to kill one to get it. Before you attack the creature, you’ll get a choice to play as Legolas. I chose to play as him and got the trophy. Kill 300 hobbits in the Shire in one playthrough (“Rise of Sauron” Campaign).I found an easier way to do this. Instead of running around. Hop into one of the fields. Only the occasional warrior and infinate hobbits will enter so if you are a mage you should have no worries. So much easier than running from Ents, damn Ents. Earn all Bronze, Silver and Gold Trophies in The Lord of the Rings: Conquest™Get all the other trophies in the game to receive the platinum.